Featuring a bold graphic stripe and a chain of delicate floral embroidery, this Marina Rinaldi shirt is a striking piece. We love the flattering long line cut. 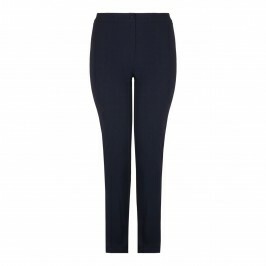 Team with tailored trousers and tonal heels for a smart and stylish daytime ensemble. Embroidered, navy and white striped long crepe-de-chine organza shirt with detachable lining. 95% Acetate, 5% Elastane. Delicate Dry Clean only.